Acting President Osinbajo wants financial institutions keeping illicit funds to face consequences – Royal Times of Nigeria. 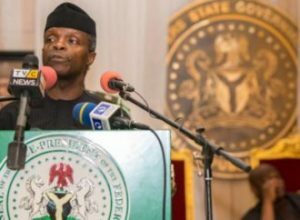 Acting President Yemi Osinbajo says banks and other financial institutions withholding illicit funds should be made “to face the consequences of engaging in criminal conduct“. Speaking at a Conference on Promoting International Co-operation in Combating Illicit Financial Flows and Enhancing Asset Recovery to Foster Sustainable Development, in Abuja today, Osinbajo said until such measure is taken, developing countries will not go far in the fight against corruption. According to Osinbajo, the transfer of illicit funds cannot happen without connivance between the countries where the funds are transferred from and financial institutions and countries to which the assets are transferred. He urged the international community to realize that it is their responsibility to ensure that they not only traced the illicit funds but also made sure that they were returned. The Vice-President also stated that those who have stolen public funds are spearheading a “media war” against the anti-corruption efforts of the Muhammadu Buhari administration. Expressing dissatisfaction with the attempt to legitimize corruption, Osinbajo said unless Nigerians see corruption as a problem that can bring down the nation’s system, Nigeria will never be able to fight.